Do you like the owner of the DJ company you’re considering for your wedding? If not, move on. DJ integrity is paramount to a successful wedding. The first vibe you pick up from a company is often telling. Don’t look back. Wedding celebrations are special. And entertainment makes the event. If there is something about the personality of the owner of a DJ company company that just doesn’t sit right with you, find someone else. For the record, that includes me! Chemistry is important at weddings. 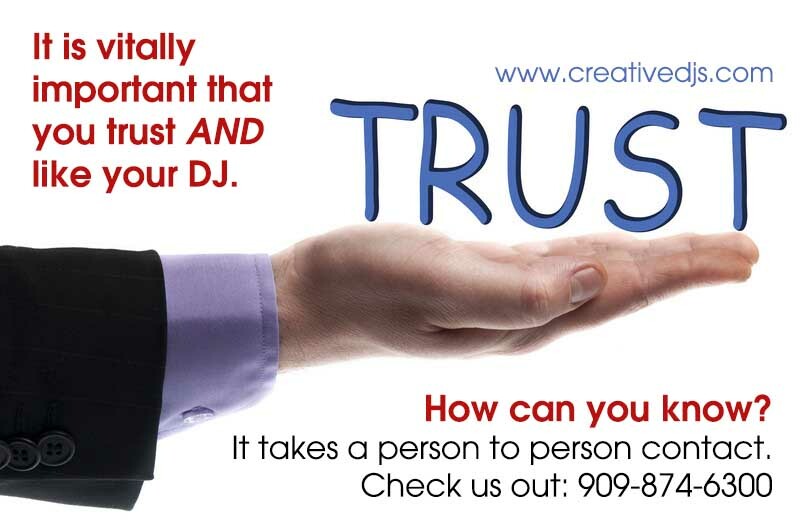 Your DJ company has a disproportionate impact on the success of your event. Choose carefully, beginning with an assessment of how well you LIKE and TRUST the owner. Now how do you do that? You need to make some sort of personal contact. You can’t do that if you’re merely filling out a form on a website and hitting send. Yes, we’ve got awesome client forms right here on our own website. They’re a start. But better yet, pick up the phone and call. Do you get a real, live person on the phone? If not, how quickly do you get a call back? And here is the key: how well do they come across on the phone? Are they warm and friendly? Do they listen? Do they come across like they care about your event? Even more, are they excited about your event? Or do you get the sense that they look at you merely as a paycheck? As wonderful as modern technology is, it does you no favors by de-personalizing the wedding planning process. Don’t let that happen to you. Pick up the phone and call us at 1-909-874-6300. We’d love to talk to you about your event. Better yet, set up a time to meet in person. This is the ultimate way for you to get to know the person who can make or break your event. This is the ultimate way for you to gauge their integrity. And DJ integrity is everything.